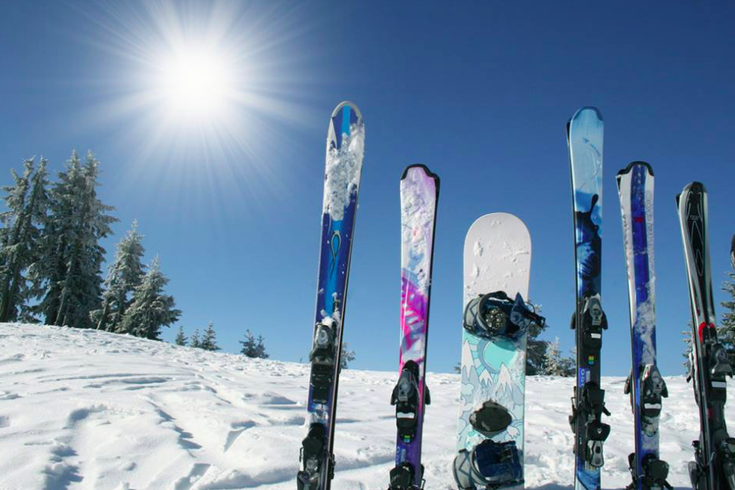 Skis and snowboards sit on a sunny mountainside in central Pennsylvania. A 21-year-old man died Sunday evening while skiing at Blue Mountain Resort in the Poconos, marking the second death at the mountain this winter. The incident occurred around 6 p.m. on a beginner terrain park trail, where the victim went off a jump and fell. Officials said the man, who was not identified, was not wearing a helmet when he fell. The victim was transported to St. Luke's Palmerton Hospital where he died of a head injury. An autopsy was scheduled to take place Monday. "Our thoughts and prayers are with the young man’s family," Blue Mountain Resort spokeswoman Tricia Matsko said in a statement. In January, 17-year-old New Jersey resident Connor Golembiewski died at Blue Mountain after he fell from a ski lift. Another man, 80-year-old Rudolpf Huber, died from a fall earlier this month at Camelback Mountain, another popular ski destination in the Poconos. "These deaths are isolated incidents that only involved the individuals and no other skiers or snowboarders," Blue Mountain said in a statement. "Safety at the resort is a top concern. We can’t stress enough the use of helmets, putting the safety bar down on the chair lift and reading the skier and snowboard responsibility code prior to engaging in the sport."